An upper level low will bring the potential for freezing rain to the Central Plains and Great Lakes on Tuesday. Snow is expected from the Plains into the Great Lakes through Friday as an area of low pressure moves across the region. An area of low pressure will continue to produce snow across portions of Oregon through Tuesday afternoon. Snow will continue for the Sierra Nevadas. Southwesterly flow aloft ahead of an approaching upper level trough will keep a layer of warm air over the region. With a stalled front in place, freezing rain is expected to develop. 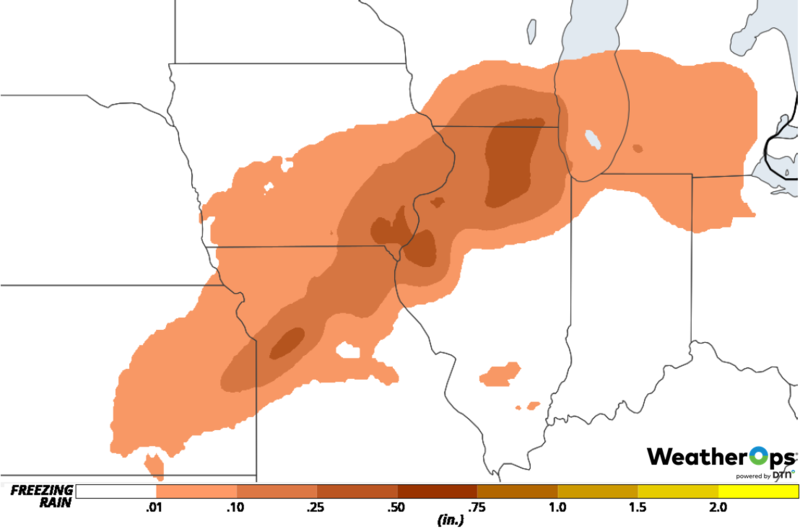 Accumulations of 0.10-0.40 inch are expected across southeastern Iowa, northeastern Missouri, and northern Illinois. 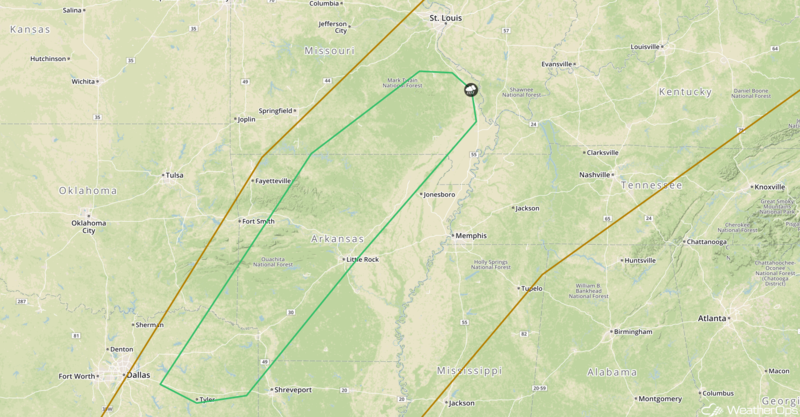 To the southwest, accumulations will range 0.05-0.15 inch. Snow is continuing across the Northern Plains and Upper Midwest. To the west, a large upper level trough is moving eastward. As it does, an area of low pressure will develop in the lee of the Rockies on Wednesday and move across the Plains and Great Lakes. Snow is expected to develop along and north of the track of the low. Snow accumulations in excess of 18 inches are expected in portions of Wisconsin. 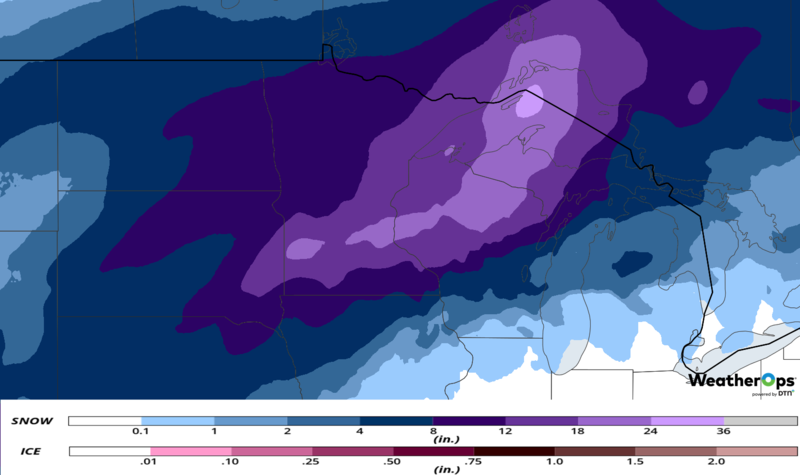 To the west and southwest, accumulations of 6-8 inches with locally higher amounts in excess of a foot are forecast. In addition, strong gusty northwesterly winds will produce wind chills as low as -10°F. Snow will continue through Tuesday afternoon as an area of low pressure continues to move eastward. Total snow accumulation will range 3-6 inches with locally higher amounts in excess of 8 inches below 4,000 feet. Above 4,000 feet, 6-9 inches with locally higher amounts in excess of a foot are forecast. 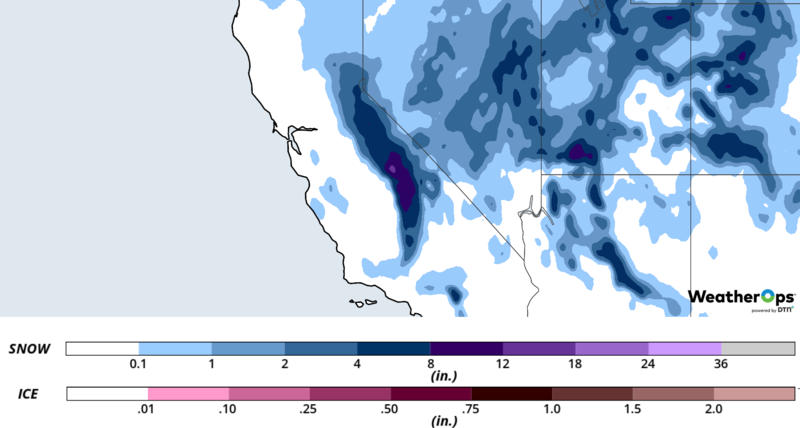 Heavy snowfall will continue across the Sierra Nevadas on Tuesday. Total snow accumulations will range 3-5 feet in the lower elevations and 4-7 feet above 7,000 feet. Winds gusting in excess of 50 mph will result in blowing snow and low visibilities. An upper level trough moving into the region will aid in the development of an area of low pressure in the Central High Plains on Wednesday. This low will move southeastward along a stalled front across northern Oklahoma and southern Kansas Wednesday afternoon and evening. A cold front will extend to the south of the low and widespread showers and thunderstorms should develop. Damaging winds and hail will be the primary hazards with these storms. 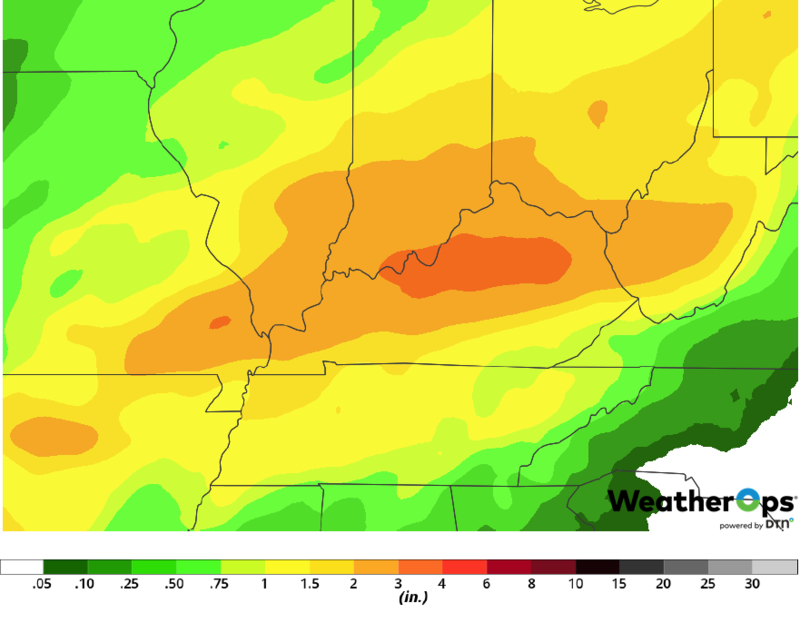 In addition to the thunderstorms across the Ohio Valley described above, there will be a potential for excessive rainfall Wednesday and Thursday. Two day rainfall accumulations of 2-4 inches with locally higher amounts in excess of 6 inches are expected. This will likely result in flash flooding, especially in low lying areas. Thunderstorms from Wednesday will continue into Thursday morning along and ahead of a cold front. Although the severe potential will be low, there may be some instances of damaging winds into the afternoon hours. Snow will continue across the Great Lakes on Friday as an area of low pressure continues to move eastward. 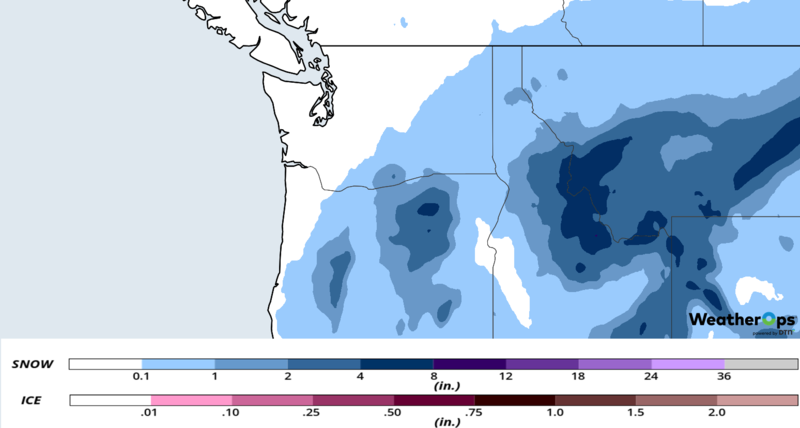 On Saturday, snow may develop in portions of the the Pacific Northwest. Freezing rain and snow are forecast for the Plains and Midwest on Sunday as an upper level disturbance moves across the region. Thunderstorms may develop across portions of Texas and Arkansas on Monday.